You Are Here: Home > Is a Sedan or a SUV better for a new driver? Is a Sedan or a SUV better for a new driver? Driving for the first time can be nerve-wracking and exciting all at the same time. Then again, so can purchasing your first ever car. There are so many choices out there but it is hard to pick one. SUVs and sedans are some of the more popular favorites. If you are looking for something with a little extra room or something that is a little more compact and fuel efficient. Both types of cars have some great options on the market right now. At Mike Anderson Merrillville, they will help you pick the best SUV or sedan that suits your needs as a new driver. Driving performance is the key for a new time driver. You want your sedan or SUV to be there for you when you need it most. If you are looking for something that will get you around the city with great mileage, small size and easy maneuverability, a sedan might be something you should consider. While driving a sedan around town or the city, a parking spot will never be a difficult option. You will be able to park with ease. With better fuel economy in the city as well, you won’t break the bank at the pumps from just cruising around or running errands. If you have to hit the highway for a road trip, a sedan will keep you comfortable with the space you need and the engine power you are looking for. New drivers who are looking to buy a new car are in luck. New cars these days have some pretty amazing technology. If you are looking at purchasing a new Chevrolet sedan or SUV, you can rest assured that both will have the same standard infotainment system. Both will allow you to use the myChevrolet app. If you are a parent purchasing a new vehicle for your teen, the Chevrolet Mylink technology has a programmable teen setting. You can control the music volume limit and even set speed limit warnings so that you know your child will be staying safe in their new sedan or SUV. Technology is a big part of our lives these days. 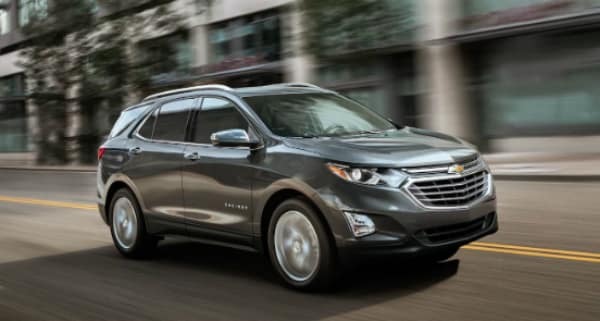 Rest assured that Chevrolet has your back no matter if you are looking for a powerful SUV or city savvy sedan. SUVs and sedans are quite the opposite when it comes to looks. A sedan offers you a sporty, slim, stylish look while SUVs have a bit of a bulky, tank-like exterior. Sedans also have lower ground clearance than SUVs, which may make potholes or rocky roads more of a threat to your car. SUVs have a bad reputation of not be as aerodynamic as a sedan or small vehicle, which is true. However, innovations have made them smoother and less boxy over the years. That being said, Most SUVs on the market today have a fierce, strong look to them, which a lot of people love. Designers are working hard these years to make SUVs look like they belong in any setting. When it comes down to it, the look of your new sedan or SUV is a personal choice. Some people prefer the boxy, big looking SUV, while others fall in love with the sporty style of modern day sedans. The interior plays a big role for new drivers as much as the driving performance. If you do not feel comfortable inside the car, you are most likely not going to purchase it. Newly designed sedans, like the Chevrolet Malibu, have been designed with comfort and luxury in mind without breaking the bank, simplified dashboards comfortable seats. It is everything you want from a sedan. With lots of legroom in the rear, ample trunk space and a spacious, attractive cockpit, this sedan feels like a luxury car without the price that will hurt the bank. Wither you are taking to the highway, cruising around town or running and errand, you feel comfortable and well taken care of in a sedan. SUVs, on the other hand, have more room in the front, in the rear and the trunk. With the rear seats folded down, there is more room for your things. The cockpit will usually have a nicely sized center console, proper spacing between the driver and passenger and a sleek, well-equipped dashboard, so everything you need is in reach on your long adventures. If you are looking to carry more than three extra people, going on a long trip or have a lot of shopping to do, the interior size of an SUV may be for you. Safety is a big concern for new drivers. Luckily, new cars have some of the best safety features imaginable. Both Chevrolet sedans and SUVs come standard with the best airbag technology and roll cages to keep you safe and sound. Add-ons to help you park, see something you might have missed in your blind spot and even a break assist option to help you avoid a possible terrible fender bender. SUVs are large, strong cars. They are built tough and built safely. The more significant size can keep you from totaling your car and saving money in the long run if an accident does occur. A sedan is a lot smaller, but that does not mean it is not safe. Due to their size, there are increased safety features and reinforced points to keep you as safe as bigger vehicles do. Safety is something that all car companies will never skimp out on. No matter the size or shape of the car, they are designed to keep you safe and sound. Being able to see all around you during the day, and have lights that keep the road well lit at night is a good thing. Luckily, all new cars have top of the line front headlights to keep you lit up in the dark. With upgradable side mirrors and rearview mirrors, seeing all around you without turning your head away from the road can be done so with ease. As for blind spots, SUVs can be tricky to see around in. Some of them have some pretty rough spots that may lead you to accidentally merging into a lane where there is someone else or turning a corner and narrowly missing a pedestrian crossing the street. Due to the smaller size the sedan, blind spots are at a minimal making it easier to see those obstacles that may be out of sight.